Contrary to the originally announced plans, the 31 Greenwood bus will not divert to Donlands Station during reconstruction of the bus loop at its home station. Instead, the buses will loop via Greenwood, Strathmore, Linsmore and Danforth stopping outside of the station. Seasonal changes to many routes. The summer cutbacks are generally in line with 2012 although in a few cases routes or periods that had cuts last year are not affected in 2013. Revised service on many routes in the Beach and in southwestern Scarborough caused by the reconstruction of Kingston Road. Streetcar service will turn back at Woodbine Loop, and bus service will be provided eastbound only from Queen to Victoria Park. Rerouting of 31 Greenwood to Donlands Station for construction at Greenwood. The service budget for September 2013 will be about 3.4% higher than the budget for the corresponding period in 2012, and 1% higher than for March 2013. 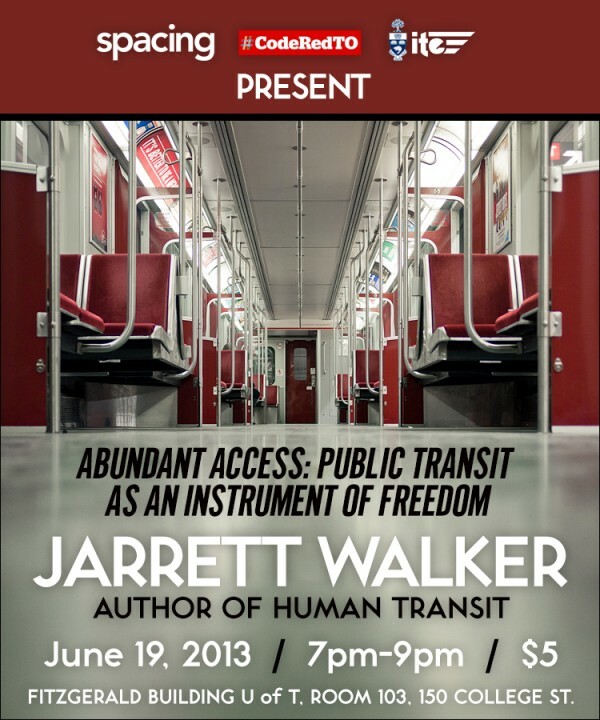 Jarrett Walker, the author of the book Human Transit and the blog of the same name, will be in Toronto on June 19, 2013. He will be speaking at the UofT downtown campus at 7:00 pm. For further details and to reserve a ticket, please see the post on Spacing Toronto’s site. Metrolinx has issued a correction via Twitter (where this discussion started) clarifying that, yes, it is person-years of employment, not jobs, that they are creating, and acknowledging that the graphics and tweets using them were “shortened”. That’s putting it mildly. Someone did a calculation to figure out how many ACCs would be needed to hold all those people, and so clearly did not understand how the numbers should be used. Someone put that chart in the Metrolinx report. The report survived Board scrutiny without anyone, including their members from the banking sector, spotting the problem. The original post from June 7 follows below. Metrolinx recently published a graphic purporting to show the employment effect of the Next Wave’s spending over twenty years. These numbers are a complete fabrication and show how an organization more concerned with puffery than with accuracy can screw up basic arithmetic. The statement here is that “enough newly employed people” would fill the ACC 48 times. The official capacity of the ACC is 19,800, and so we’re talking about 950,400 newly employed people. That’s roughly 1/3 of the entire population of Toronto. The math is straightforward: $2b/year divided by $80k gives 25,000. If the entire amount goes to net new hires, then that’s 25k. Do this every year for 20 years, and you produce 500k person-years of employment, but not 500k new hires. There will be some multiplier effects in that an employed person has money to spend and that will find its way into the local economy. How many new jobs will result is another matter. We can look at this from the reverse angle: if there is $40b on the table, and it has to be shared among 800k new hires, then each of them will receive $50k. In this, I have assumed that even the 25% of revenue dedicated to municipal projects creates jobs on the same basis as for the 75% allocated to the Next Wave. Metrolinx has similar math challenges on commuting times when they routinely confuse avoided future congestion with actual savings. Moreover, the claimed “saving” only occurs if the entire Big Move is built, something that appears vanishingly likely. Because Metrolinx only ever discusses their fully-built scheme, we have no idea of how much “saving” will accrue for intermediate stages of the network, nor of the variation in benefits across the region. This most basic of business analyses is totally missing, at least in any published Metrolinx papers. Metrolinx really needs some remedial work on economic analysis and basic arithmetic. Think about it: does it really take 1/3 of Toronto’s population to build a transit network? I have to repeat: the Metrolinx claim is not for job-years, but for newly employed people, nearly one million of them. That’s a basic reasonableness check anyone should be able to spot. How did such a claim even get out the door? Howling errors like these job creation numbers undermine credibility not just of an incompetent agency but of the government who looks foolish for making claims they cannot possibly deliver. What Does Subway Construction Cost? An interesting article on the site Pedestrian Observations was recently linked on Twitter by Taras Grescoe (@grescoe), the author of Straphanger. In Comparative Subway Construction Costs, Alon Levy attempts to bring together projects worldwide, adjust for currencies, inflation and other factors to derive comparable US$ values for subway construction. The numbers are interesting in light of complaints about overpriced construction in Toronto. The underlying problem, of course, is that no two projects are the same. Varying proportions of underground construction, different soil/rock/water conditions, variations in station numbers/size/depth, not to mention rolling stock procurement and yard/maintenance facilities all affect the total cost and hence the cost/km. Stir in political differences and the ease or difficulty with which projects are approved, and the number of variables is quite high. All that said, Toronto’s costs are not wildly out of line. This is not to say that they may not be excessive, but the cause could be our extended design and approval process and a preference for deep bore tunneling that drives up construction costs compared to shallower cut-and-cover. The argument for LRT has always turned on the availability of a surface option where it is practical. Whether we choose to exercise this in every possible case is another matter. There are cases where underground construction is the only practical way to build a line, but that should not condemn Toronto to building only subways without looking at alternatives. TTC CEO Andy Byford was hired by former chief Gary Webster to modernize management practices and provide focus to an organization that had lost its way. Thanks to Webster’s ousting at the hands of the subway-loving, LRT-hating Mayor Ford, Byford unexpectedly found himself top dog. After a year in Toronto, Byford released his five year corporate plan on May 29, 2013. Those of use who follow the TTC closely have heard a lot about this plan as a centrepiece for the future of our transit system. Byford’s talks at meetings around the city, most recently a Town Hall presented by Councillor Josh Matlow on the eve of the plan’s release, raised expectations for a major document, a fundamental shift in how the TTC would operate. If this were a summer movie release, Byford’s appearances would be the equivalent of ever more tantalizing trailers and “sneak peeks” at what would come. The plan’s release was something of an anti-climax — a press release via web and email, no additional information, no political feedback to indicate support. The TTC board discussed the plan in its private session at their May 24 meeting, but made no public comment. Internally, the plan was launched at staff meetings that will continue over coming weeks to reach throughout the 12,000-strong company. Media attention is, to be generous, muted with the story completely submerged under the Ford follies at City Hall and the Metrolinx Investment Strategy.